Trump To Carolyn: You're Fired! 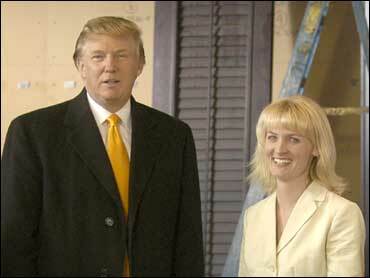 Donald Trump axed "Apprentice" sidekick Carolyn Kepcher earlier this week, the New York Post reported on Thursday. Portrayed as an icy blonde on the NBC reality show, which debuted in 2004, Kepcher, 36, who worked for Trump for 10 years, "became a prima donna," following the success of the show, one insider told the newspaper. "Being on 'The Apprentice' went to her head. She was no longer focused on business. She was giving speeches for $25,000 and doing endorsements." Kepcher, who was running Trump's National Golf Club in Westchester, N.Y., and supervising the Trump National in Bedminster, N.J., had booking agents and a bevy of appearances on her schedule. Her plate was so full that when Trump tried to reach her recently she was off on a speaking engagement, according to the paper. Trump is currently filming the new season of "The Apprentice" in Los Angeles and his daughter, Ivanka, will now be one of his TV sidekicks. She filled in last season too. Don Jr., Trump's son, is the successor to George Ross, Trump's other sidekick. "George has been around a long time. He's seen everything. He didn't get excited even when women on the street started screaming when they saw him on his way to work," a source told the Post. "But Carolyn took it very seriously. She thought she was a freaking movie star." For Trump's part, it appears he has no hard feelings toward Kepcher. "He wishes her well," Trump's assistant Rhona Graff told The ShowBuzz on Thursday.